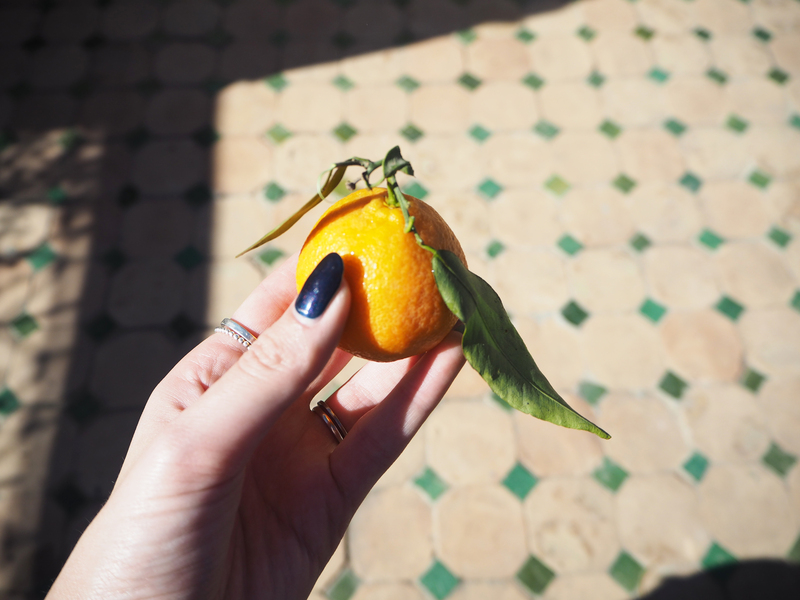 Morocco has always been on my bucket list, Casablanca was my destination of choice (for obvious reasons) but after having experienced a city thats a riot of colour, immersed in History and culture I will definitely be going back to Marrakech! 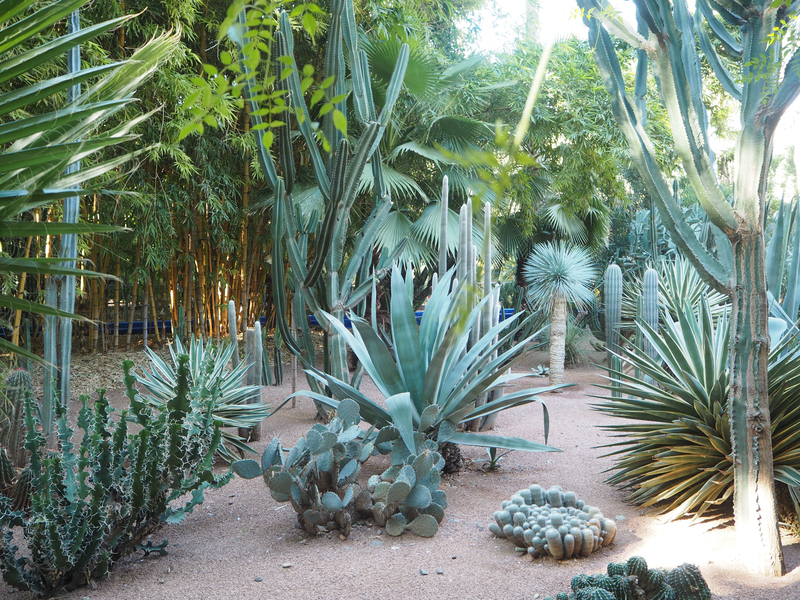 First on our trip was a visit around the Majorelle gardens, full of cacti the gardens were built by Jacques Majorelle and saved years later by Yves Saint Laurent and Pierre Berge, they moved into the villa in the garden and set to restoring and expanding the garden, with the aim of making the most beautiful garden, I for one think they succeeded. 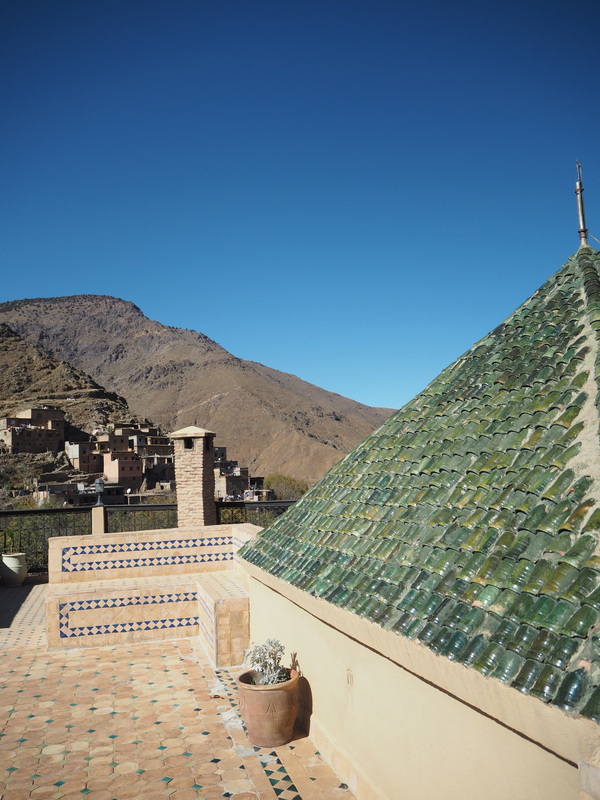 The artist studio in the gardens now hosts a Berber Museum celebrating the culture, it also houses the personal Berber collections of Yves Saint Laurent and Pierre Berge. 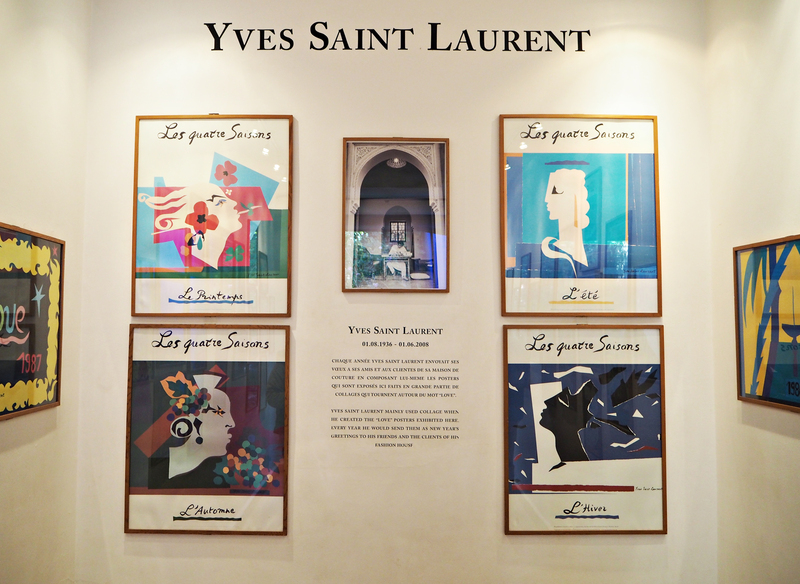 Yves Saint Laurent’s ashes are scattered in the rose garden of the Villa with a small monument to mark the passing of a fashion powerhouse. I could have spent hours wandering around these beautiful gardens, they are definitely a must see but I’d advise arriving early to avoid crowds and to experience the gardens properly and in relative peace. Next up we had a wander around the Menara gardens, full of olive trees and fruit trees the garden was originally built as an escape from the bustling city and the oppressive heat, a man made oasis of calm and it’s been there since the 12th century! 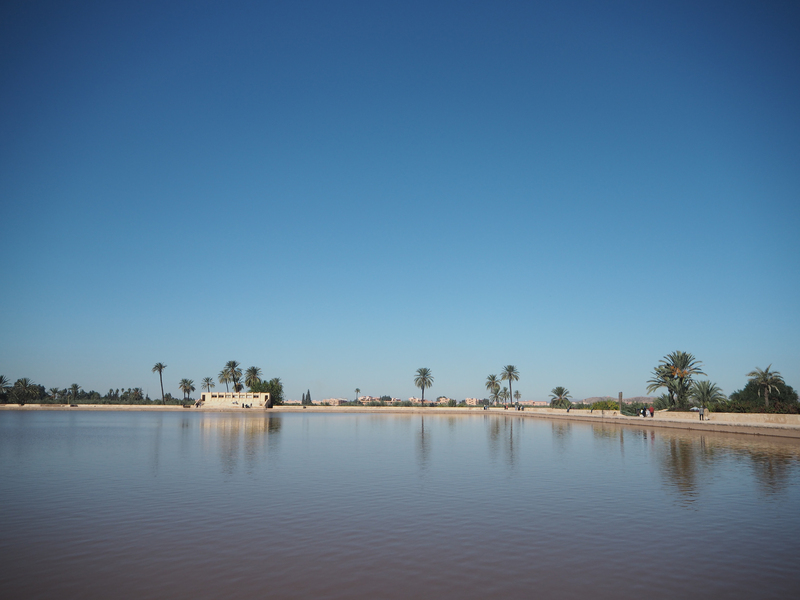 The highlight of the gardens has to be the pool, because Marrakech is so flat the sky reflects perfectly making the pool look like a huge mirror, no swimming tho as it’s used to irrigate the gardens and is full of fish! The gardens are so massive you can see them from the plane, like a big green rectangle in a sea of sand. Carrying on with the historical tour we headed to the Badai Palace and the Saadian tombs, both are ancient and parts are in ruins yet they are still beautiful, from the tiled floors that are still in tact after centuries to the blooming rose gardens and orchards it’s easy to imagine these places in all their majestic glory. 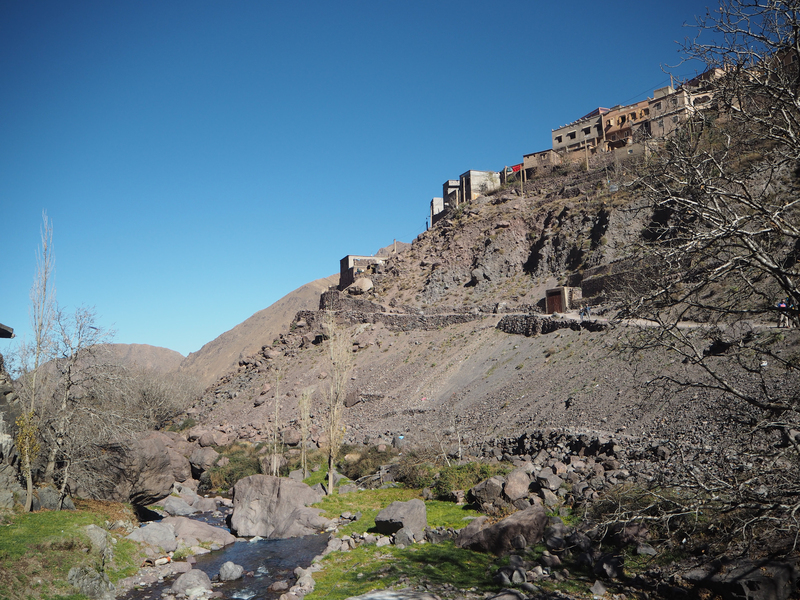 Next on our trip was the Altas Mountains, you can watch me trying to vlog from the back of a donkey here. 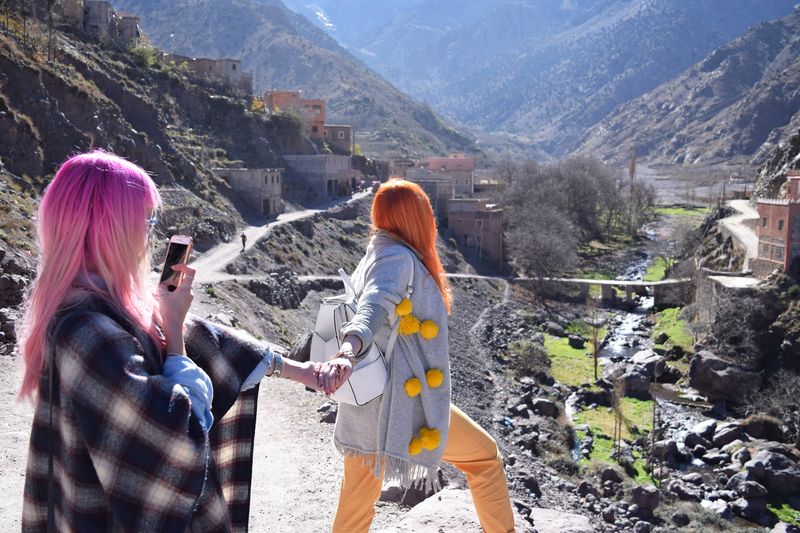 We started the morning with a drive to the Berber Village in the mountains, it’s about an hour’s drive from Marrakech so obviously we passed the time by trying not to look over the cliff edges we were driving scarily close to & singing along to Queens greatest hits. Once in the village we trekked up to a tiny cafe for some tea & possibly the best bread I have ever had in my life! We walked back down the mountain on a much easier route, although obviously I fell over! 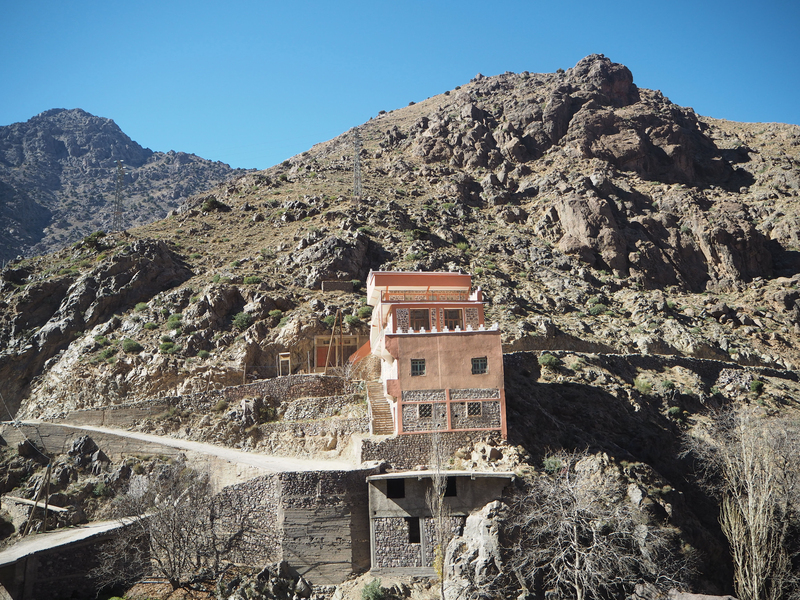 We got to see how the houses are cut into the mountain side and learned why they are all a shade of pink hued orange…it deflects the sun! So it keeps the inside cool no matter the temperature outside. Lunch was home-made Tagine with bread and moroccan salad, definitely one of the best meals of the trip. 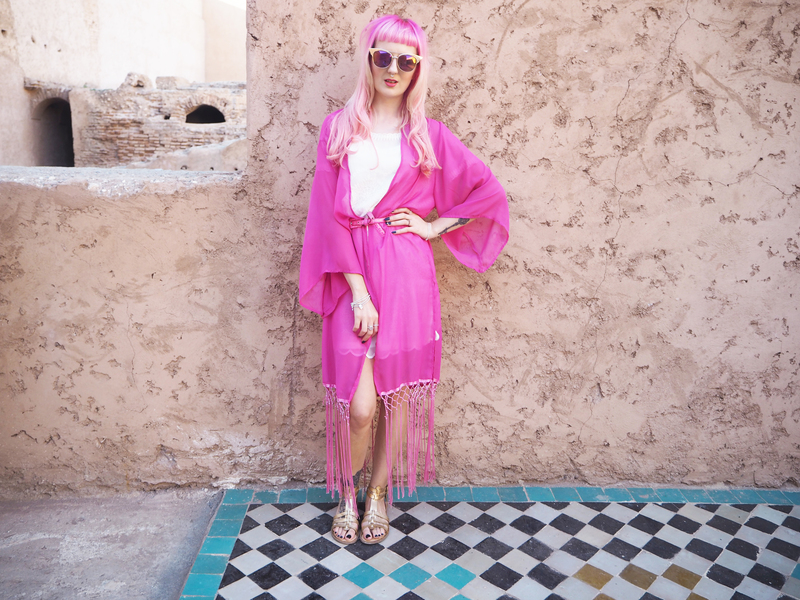 The Souks are something you need to experience, they are completely insane! 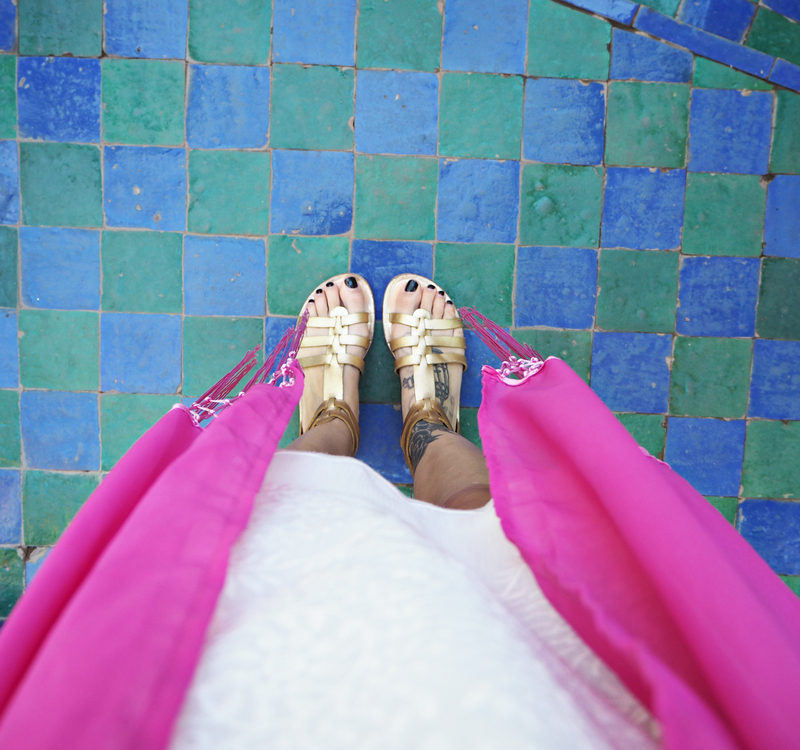 I had a bit of a love hate experience with the market in Marrakech. The square that is basically the entrance to the souks was not my favourite place, they had monkeys on chains, snake charmers, 100’s of terrapins in tiny cages, all in all I did not have a good time walking through the square. I completely understand different cultures etc but as an animal lover I did not enjoy it at all. Luckily the actual markets are all homeware, clothes and accessories, basically the polar opposite of the square! The highlights for me had to be the homeware, they had everything, and I mean everything! From fridge magnets to garden fountains! I got a massive pouf, some adorable jars, a bag of dried rosebuds, a massive plate (that broke on the plane home, le sigh) and a traditional Moroccan teapot with some amazing Moroccan tea which I can’t get enough of! 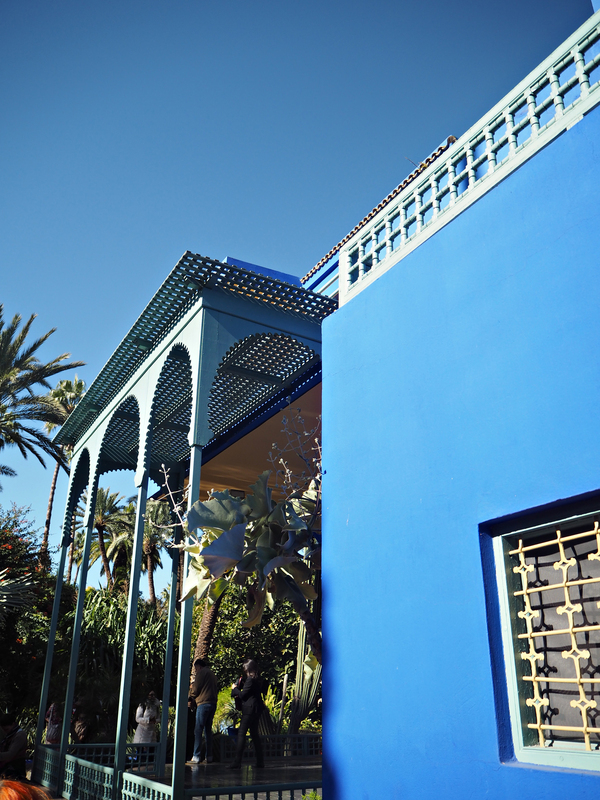 The trip ended on a massive high, a visit to the Dior Institute at the Es Saadi Palace Spa! We had the Oriental Thermae experience, a mixture of herbal baths, traditional saunas, ice fountains and steam baths, the perfect way to relax, unwind and clear the senses. The spa itself is stunning, the main pool has a tree that grows in the centre, you really need to see it to believe it! As they take privacy very seriously we were not allowed any photos but we managed to snap one in the hallway, how beautiful are the tiles? 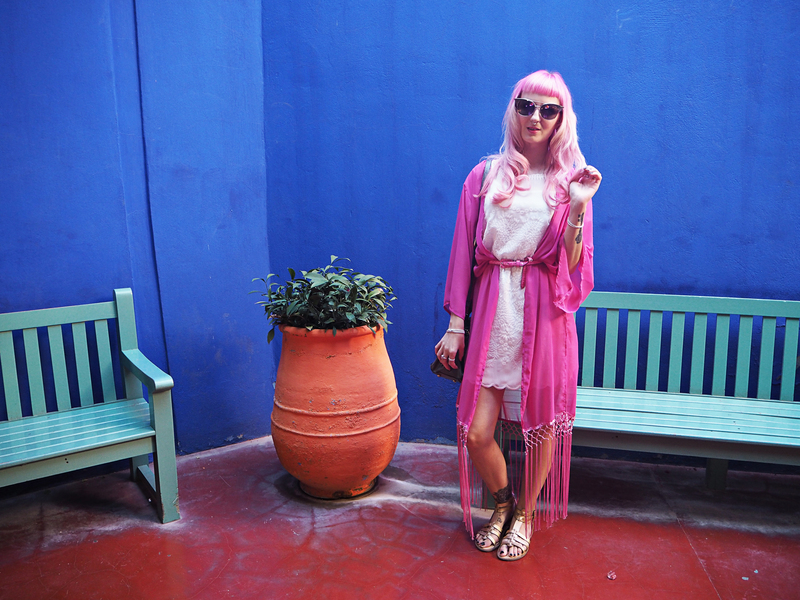 A whirlwind few days in Marrakech was certainly not enough for me, mark my words I will be back. 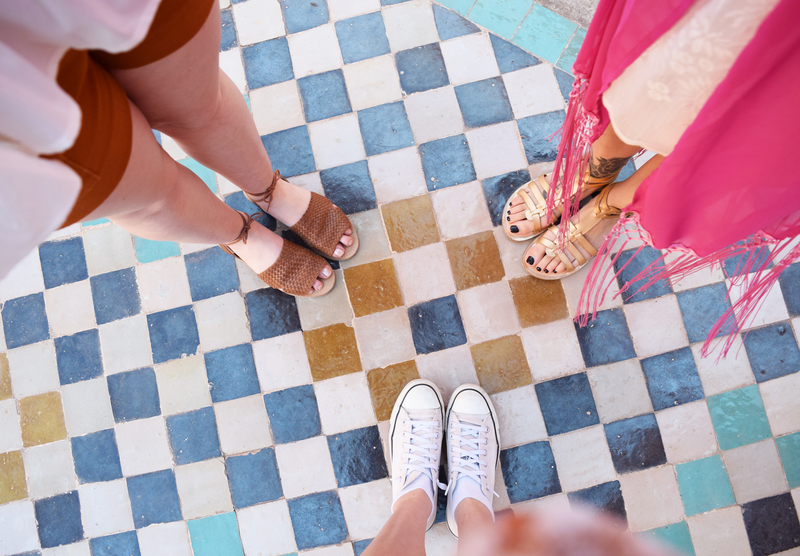 Watch the Colour Pop Girls first Vlog below! this looks stunning! 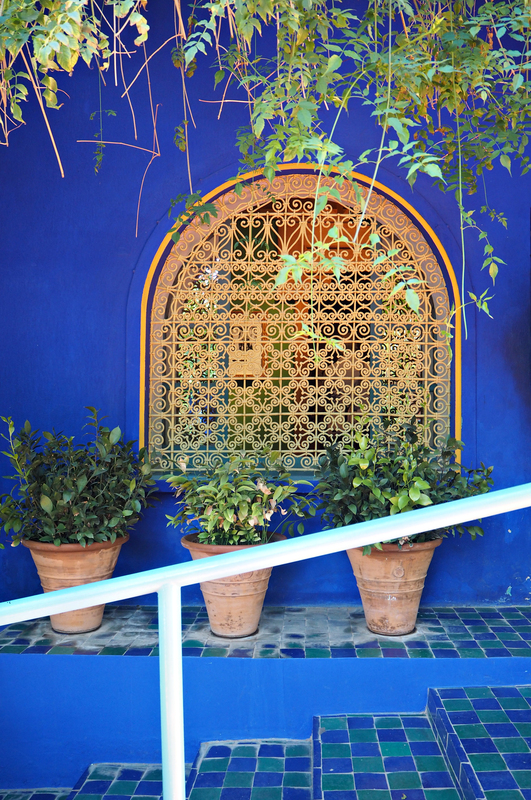 Morocco is one of my dream places to go too. Looks like you’re having a fab time!